We have written posts previously about microblading to help people feel themselves again after a cancer diagnosis and treatment. It takes both a physical and emotional toll on the body to discover you have cancer. The good news is; there are many resources available to help someone “bounce back” post cancer. As a Practitioner of skincare, aesthetics, permanent makeup and makeup application, I am armed with tools that make a world of difference in one’s life. Although some might view my job as a superficial one, it is hardly that. Not everyone I see has the perfect “canvas” to work with. For instance, if I am using permanent makeup do a 3D areola on a patient whose skin has been compromised from mastectomy, surgeries, scarring or burns from radiation, it can make it hard to envision the outcome (as a patient). As a Practitioner/Tattoo Artist, I give hope to my clients while also shutting the door on their diagnosis. Typically with a 3D Areola client, it means they are at their end of their journey. And now, micro blading (a trend word) is expanding beyond the eyebrows and onto the scalp. It’s being used to help people who are losing their hair, and those whose hair is naturally thin mimic the look of real hair. 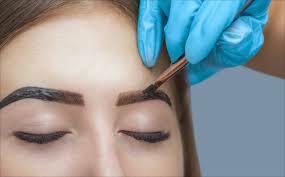 Microblading is actually “permanent make-up”; the process doesn’t attach real or artificial hair. It makes its’ clients heads appear to have more hair than they do. The results truly are stunning. Good emotional health is as important as good physical health. A lack of self-esteem and confidence can lead to depression, among other issues. Of course, no one will be surprised to learn that self-esteem is very often, if not universally, to a considerable extent tied to our appearance. Jonas Salk cured Polio 60 years ago; Neil Armstrong strode upon the lunar surface 48 years back. Yet even with those great accomplishments, (and a massive array of other scientific achievements since) Medicine has still been frustratingly unable to develop a viable means to deal with hair loss. Consider please that the problem expands beyond normal genetic balding. Issues like stress, chemotherapy and alopecia can cause abnormal hair loss. Some can remove clumps of a person’s hair while leaving the rest. Any medical issue is tough enough without it taking a toll on a patient’s appearance, too. If you are a patient and permanent makeup is of interest to you, you may want to ask your doctor or Oncologist for his or her opinion on the subject. We would also be happy to partner you with a Practitioner/Tattoo Artist that we feel has all the qualities that are necessary to carryout this important personal task. Retinyl Palmitate and You: Imperfect Together?